Last week on The Strain, we saw someone going through the process of turning into a vampire, brutal phase by brutal phase. 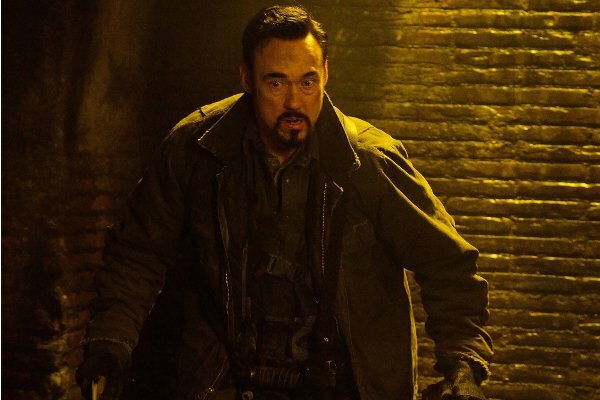 By showing us kids and their mothers getting vamped, The Strain seemed to be gearing towards its finale – set to occur after next week's episode. While this week is a more subdued episode of this eventful first season, it still provides some good moments of character and action. Two “B” characters got their moments in the limelight this week, as Gus and Zach respectively showed off some impressive vampire-hunting skills and really good street smarts in a world that's slowly going to hell. In the case of Gus, he arrived home to find that his older brother Crispin and his dear mother had both been turned into vampires. After disposing of his brother and leaving his mother alone, Gus leaves to take care of that landlord that harassed him towards the beginning of the season. This puts him on the same path as Zach, who's big mission of the season is getting Mrs. Martinez some cigarettes. It's a ridiculous fetch quest that puts Zach in danger for thrills, but what's so good about this plot line is that his logic for running this errand, as well as how he goes about it, is very sound in logic. Zach knows that any comfort Mrs. Martinez can derive will keep her quiet and inside the building. Normally the kid characters are the ones that are put in danger for no good reason, just to generate drama. Thankfully, the danger was real, while at the same time moderately sensible and vital to the plot. Another big happening this week is the official start of the Eph/Fet rivalry that looks like it's been brewing for a couple of weeks now. The two would-be apprentices of Abraham Setrakian have very different skill sets, and thus two different methods of fighting off the vampire hordes. However, while Fet is looking more badass as the days go on, Eph is starting to look rather ridiculous, with this week's Kelly-themed trap making him appear even more ineffectual. This week's proceedings culminate in a standoff with The Master that is a little smaller in scale than some would have expected; but as any good gamer will tell you, you can only get a couple of hits against the big boss before going on to the final round. Thankfully, Fet's ultraviolet light bombs (another Del Toro-ism The Strain has copied from Blade II) helped scare The Master off and saved Eph's life in the process. Life-saving as it may have been, Setrakian is pissed that The Master left with only a couple of scratches and a couple fewer minions to show for it. Out of frustration, Setrakian sledgehammers the coffin he built so many decades earlier. As he goes to town on his own craftsmanship, he declares that since he won't rest until The Master is dead, neither will his vampiric menace. “The Third Rail” works as a great first act in what looks like a three-week finale event. Next week, we'll be recapping the intense looking Act II of The Strain's unofficial three-part closer. Join us next Sunday for episode 12, “Last Rites!" If you're still hungry for more bloody excitement, then stick around for this week's Nitpicks, Notes, and Nods. *Those worms haven't been as much of a problem in the show as they have in the books. No one seems to worry about them once they've beheaded or dismembered a vampire. *Zach and Gus never have a reason to meet, thus they never do. * Eph seems to be a little less battle-ready than he was in the books. As a matter of fact, it feels like Fet's role has been stepped up in the show, just for that reason. *The whole subplot with Gus and the Vampire SWAT team looks like it's coming back next week. It's about time, as that was started weeks ago, and could have used some minor development here and there in the past couple of outings. *The leadership crisis really didn't hit the group until The Fall.